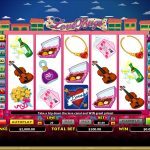 Love Bugs is a video slot game coming from Microgaming software. Love is in the air and the bugs are feeling it. The slot has an interesting and cute theme about the Lady and Love Bug, who are travelling down the canals of romantic Venice. What better place than to express your love for your partner. The slot has attractive game symbols and interesting animations, along with a fast game play. This is a cute video slot which you will simply fall in love with. All you need to do is try the game for real play and see if love is on your side. Love Bugs is a video slot with two wild symbols, the Lady Bug and the Love Bug. The Lady Bug lands on reel 1 only and the Love Bug lands on reel 5 only. They will each substitute for all of the game symbols except for the scatter symbol. The scatter symbol in the game is the Heart and he can land on all of the reels. He awards a maximum payout of 100 x stake for 5 of them on the screen. The slot has a free spins bonus which is triggered when the Lady Bug lands on reel 1 and the Love Bug lands on reel 5. This feature cannot be re-triggered and players can win up to 40 free spins. The bugs catch prizes from the bridges in Venice. Every Diamond Necklace which is caught will award 10 free spins. If the Diamond Ring is caught all prizes in the bonus round will be doubled in size. 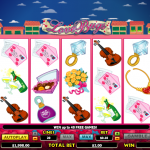 Love Bugs is an interesting video slot which can be found across all Microgaming casinos. 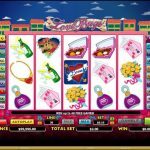 The designers did a good job with the visual details in the game and also created an attractive free spins bonus which can produce nice payouts. Do you like the rich culture of China? then you should consider playing House Of Dragons a 5 reel slot by MicroGaming.